When off-the shelf products don’t quite fit your needs, VELCRO® brand Hook & Loop Fasteners can be dyed to any pantone color, as well as custom matched to your sample. Need a special shape? We can die-cut it for you. Let us help you bring your dreams to life. Levitt Industrial Textile can also help provide you with VELCRO® brand hook & loop fasteners in a variety of put-ups. Our precision cutting equipment allows us to cut-to-length virtually any VELCRO® brand material, Self Adhesive or Sew-On. The hook & loop may also be mated together before cutting to your required length. Do you need cut-to-length mated sets packaged in heat-sealed bags with 10 sets, a cleaning pad and instruction sheet in each bag? Do you need 36” pieces shipped in bundles of 10? Levitt Industrial Textile can do that, too! Just give us a call toll free at 1-800-548-0097 and let us know your requirements. One of our experienced application engineers will work hard to provide you with the right VELCRO® brand products, fabricated and assembled the way you need it. 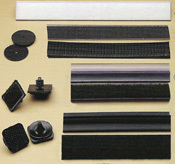 VELCRO® Brand Products are available in a variety of for unique applications.